We certainly enjoyed last weekend with our 1-0 victory over Trafford in the Emirates FA Cup 2nd Round Qualifying match. It is very encouraging that, once again our attendance increased and obviously the team results so far this season is playing a part but we are also creating more interest through our social media and website coverage so I really must thank Dean Maynard and Richard Cooke for all their efforts so far this season in raising awareness and the club profile. Before the Trafford game we won a hard-fought ‘derby’ game against West Auckland, a match which resulted not only in a victory for the Club but a soaking for all of us who attended when the clouds opened right at the end but I don’t think anyone minded that much! Because there had been no matches the previous Saturday and mid-week the Heritage Park pitch had some ‘rest’ and had been fertilised by the Grounds Man so the team were able to train on the pitch on Thursday night. When Darlington do eventually leave us to move to Blackwell Meadows the team will be able to hold more training sessions on the pitch. The Trafford game was very much different to the previous game against Ossett Albion and we really were up against it in the second half but our players fought hard and played well as a team ensuring we got the result we wanted. After the game Steve Coulthard, myself and two of St Mary’s Under 14’s presented the first Darlington Building Society Man of the Match Award to Scott Martindale. Well done Scott! It has been great to meet two of our former players over the last few weeks. Mike Greenwood who played for us in the early 1960’s and who represented Great Britain in the 1960 Olympic Games held in Italy attended the Ossett Albion game and Bob Thursby who played in the 1957 (the third of our hat-trick of victories) FA Amateur Cup Final and who represented England at Amateur International level attended the game against Trafford. Also at the match on Saturday I was delighted to meet Alan Adamthwaite who has written two books about the Bishop’s. 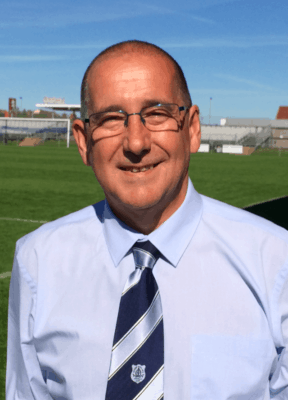 The first book he wrote is called ‘Glory Days’ and the second (which we have available to buy from the Club Shop) is about Bob Hardisty and is called ‘Never Again’. We were all hoping for another home tie when the draw was made for the Emirates FA Cup 3rd Round Qualifying Round but never mind, I think we are all reasonably happy with our away trip to Farsley Celtic. One of the last times we played down at Throstle nest was on Saturday 9th November 2002 and we gave a debut to ex-Sunderland player Martin Gray (wonder where he is now!!). We got beat 3-0 and in addition to five yellow cards received Martin Gray was sent off for two yellows!! As I said earlier our home support has been magnificent so far this season and we really need your support for the game at Farsley Celtic which is only around 13/4 hours from Bishop! Along with The BAFC Supporters Clubs we are hoping to have at least 3 coaches travel down including the official team coach. 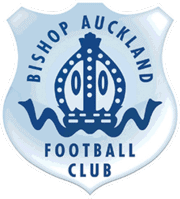 The Supporters Club are arranging a coach to leave Bishop at around 10:00 / 10:30am and return at 7:00pm to allow supporters to have some time before and after the game to have a couple of drinks as well as enjoying the game. The Club will book at least another two (hopefully more) coaches including the team coach and we expect to leave Bishop 11:30 / 12 Noon. If you are interested in travelling and creating a ‘home’ atmosphere at the ‘Throstle Nest’ then please see any Club official / Supporters Club member at our next home games or email me on the address below. After the League game against Whitley Bay on Tuesday night we will be preparing for our Friday night fixture in the FA Vase against Billingham Town, kick off at 7:30pm. One job we are hoping will be completed by then is the replacement bulb in one of our floodlights which has been scheduled for this week.